BAYAMON, Puerto Rico, September 27, 2009 – Dominican Prisilla Rivera was elected the Most Valuable Player of the NORCECA Women’s Continental Championship won by her side in an emotional final match against Puerto Rico. Brenda Castillo, also from Dominican Republic, was the most heralded player in the closing ceremony taking the trophies as best digger, best receiver and best libero. Cubans Yanelis Santos and Nancy Carrillo were selected as best server and blocker respectively and their young teammate Wilma Salas received the award as “rising star”. 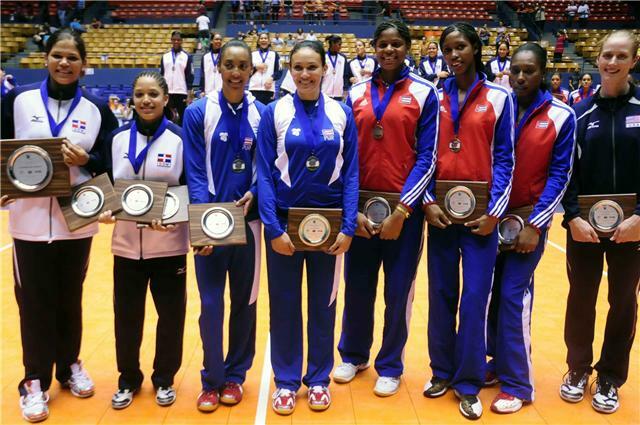 American Nancy Metcalf resulted in the best spiker and Puerto Ricans Aurea Cruz and Vilmarie Mojica were recipients of the recognition as best scorer and setter. The awards were presented by the President of NORCECA Confederation Cristobal Marte Hoffiz and Nelson Perez, President of the Puerto Rican Volleyball Federation.